What a beautiful Saturday we had for a paint-out at the Heritage Square Museum. It's an architectural museum showcasing eight historically significant Victorian-era buildings. They were moved to Heritage Square between 1969 and 2005, saved from being demolished at their original locations. The open-air museum is lovely to visit and tours are available. As I painted, the bits I heard of passing tours were fascinating, telling the development of Los Angeles. 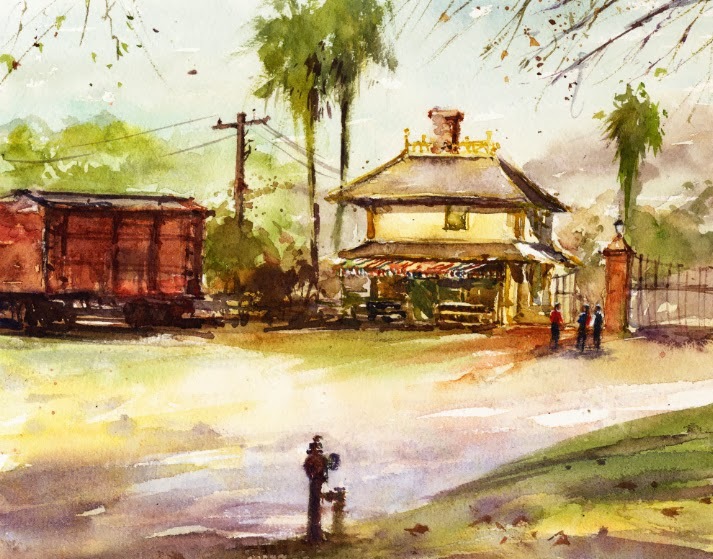 I chose a shady spot to paint a view of the Palms Depot, built in 1875, and the railroad car. We also saw a resident cat, chickens, and a rooster. I'm looking forward to a another visit, and maybe another paint-out, around the holidays when the buildings are decorated. A recent Saturday paint-out was at Defenders Parkway. Well, I didn't know the official name until I walked around and looked at the various monuments recognizing the founders of Pasadena, and "Defenders of the Flag Soldiers". It's a small grassy area and walkway at the east end of the Colorado Street Bridge which a visitor can walk out on from the park. It was another beautiful Saturday for plein air painting. I couldn't decide whether to paint the bridge view to the west, or the city view to the east which included distant hills and the city hall. I chose the city view since I didn't feel up to the wonderful structure of the bridge with its arches, light standards, and railings. 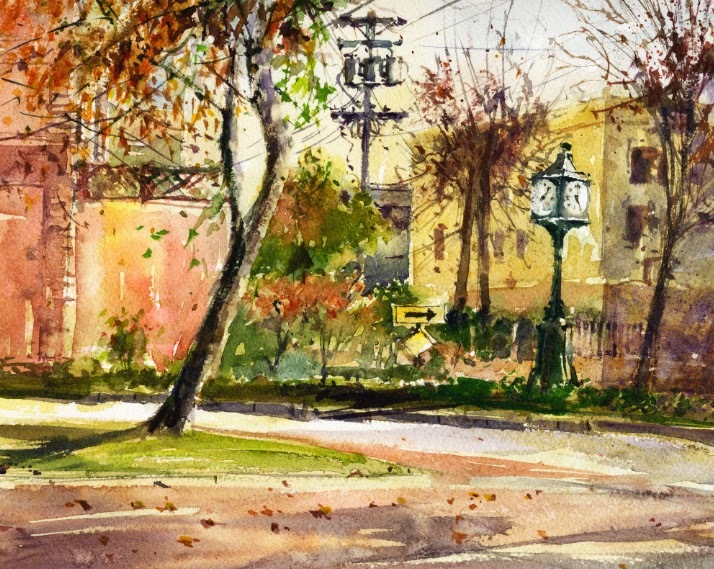 The small parkway was a very popular spot for dog walkers so I added one to my watercolor. It was such an enjoyable morning just a few feet from a very busy intersection. In summer 2012, I painted a watercolor of the Gamble House in Pasadena, California. 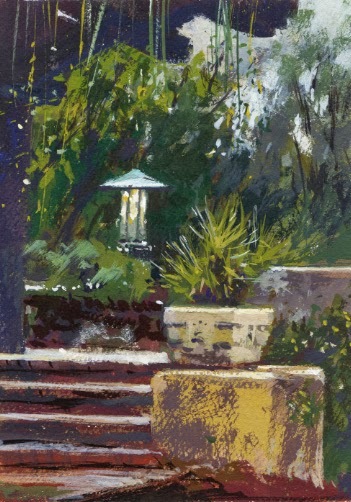 I posted my painting and a bit about the landmark house in The Gamble House. Designed by Charles and Henry Greene, and built in 1908, it is considered to be America's Arts and Crafts masterpiece. It is stunning, and every visit there is special. The house has a certain feeling about it, very calming and elegant. On my previous paint-out there I found the house to be very difficult to paint in watercolor. 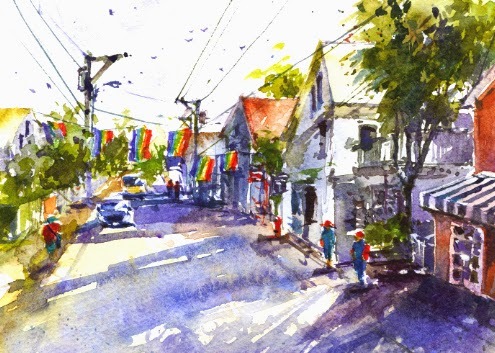 Its many rafters and porches, and stained wood color, make a watercolor challenging. This time I decided to try a smaller view. The beautiful stained glass lantern on the back patio caught my eye and I went for the gouache. The public tours of the house were the only mild distraction while painting this serene scene. Our group had such a lovely morning there. 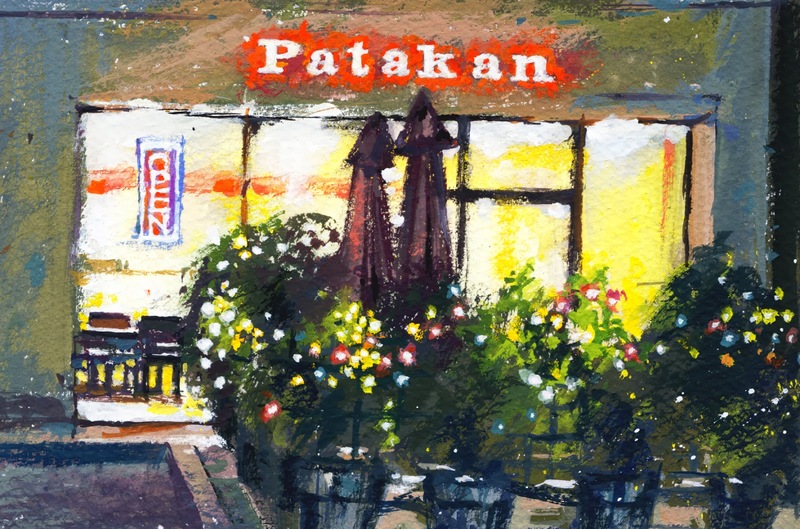 I've painted plein air pieces in South Pasadena, where I live, quite a few times now. My first painting was posted in Plein Air Painting. Another, painted in the same block was Century House. This paint-out was in the area of our light rail Gold Line station, Mission Station. When the light rail project was being planned, the City of South Pasadena wanted public art integrated into the station and related to the community. The long Metro Art process resulted in a large and wonderful metal walking man sculpture by Michael Stutz, titled Astride-Aside, which really sets our Mission Station apart. It's over 12 feet high! We Saturday painters met in the Gold Line station area again a few weeks ago. I enjoyed painting this view across the street from the walking man with the winter trees, clock, and utility poles. I've wanted to add a figure or two but can't quite decide where and what size. So, maybe I'll leave it alone. I might try the walking man sculpture next time. 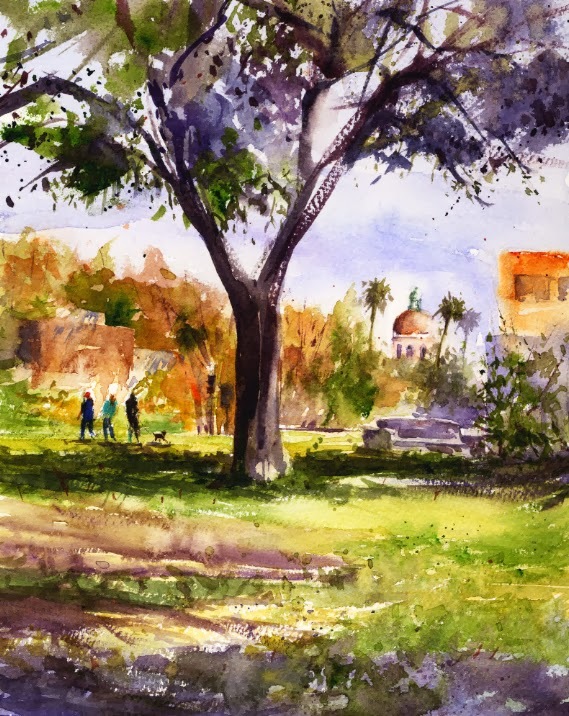 A paint-out a few Fridays ago was at the Ambassador Gardens in Pasadena, California. The beautiful gardens are located on property which was the campus of Ambassador College (Worldwide Church of God) until 1997. Starting in 1947 the college began acquiring lavish mansions along Pasadena's "Millionaire's Row". Today some mansions remain on the large property. It's the home of a high school, a portion is being re-developed for "multi-use", and the extensive gardens are available for events. 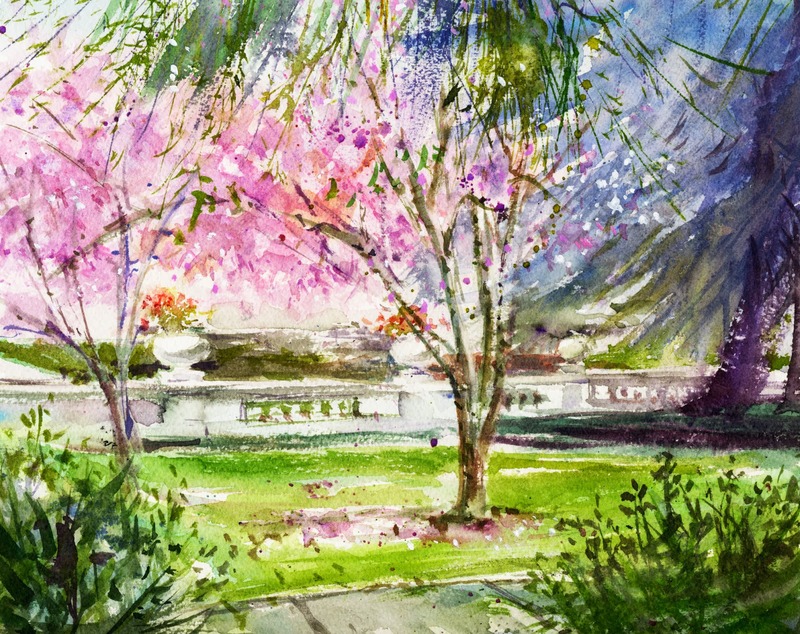 We plein air painters were lucky to be there when the lovely, pink, tulip magnolia trees were blooming. The day was very overcast but we were thrilled with the location. I was able to paint a watercolor as well as a smaller gouache piece. We were almost finished with our discussion of the morning's paintings when gardeners arrived to rake and loudly blow all of the pretty flower petals up, off of the lawn. Looking forward to another paint-out there. A gift, as well as something new for me to try - a night scene! I really enjoy the oil paintings of local scenes at night by artist (Ezra Suko) and thought I might try one in gouache. A friend works at a nearby favorite restaurant and she's moving back to Thailand very soon. She asked me for a painting to take with her! What would be a good choice? I took a photo of the South Pasadena restaurant at night because the colorful lights around the patio are so festive. I thought a small gouache would be fun and not too much to pack. Our friend, who worked there for ten years, was surprised and touched when I gave the framed painting to her. Maybe I'll try a night scene in transparent watercolor next which I think would be quite a challenge. Last January I was seeing quite a few paintings featuring white flowers. It seemed to be a January "thing" and I wanted to try a bouquet with white flowers. I was going to buy a bunch and try a watercolor from life but I didn't get it done. 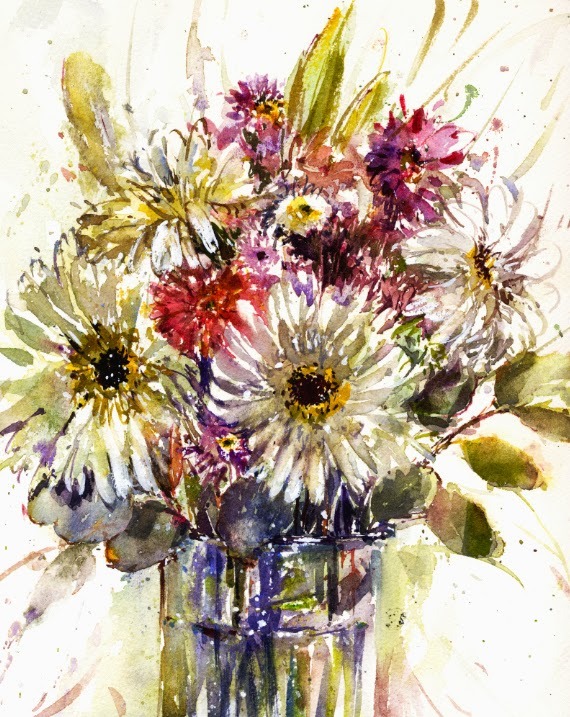 Now January 2014, in the online watercolor class instructed by Vinita Pappas (Create 38), her demo for the month was a floral which turned out beautifully. I needed the push with a deadline to finally try a floral from life. I bought a pretty bouquet at Trader Joe's that had some white daisies with dark centers which really appealed to me. It was fun to paint and I should try this more often. 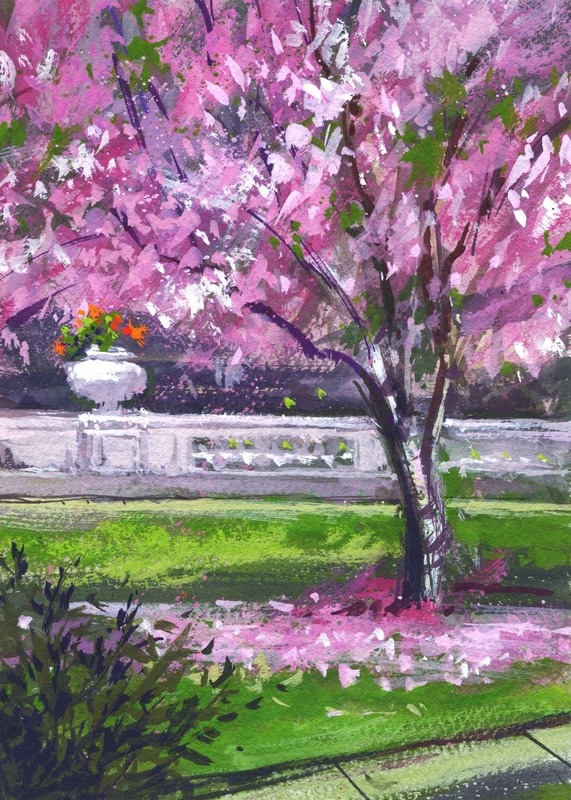 It came to mind, that in addition to my current plein air painting, maybe I haven't tried a watercolor floral from life after all of the flowers I painted when I was illustrating greeting cards. The watercolor flowers I painted for the cards were usually pretty detailed. The whole card with calligraphy, which I did first, then painted the illustration, took quite a long time, many hours. All of the petals, leaves, and stamens were outlined with a crow quill pen first, then painted. The complete opposite way of painting that I'm doing now. Both were fun though! 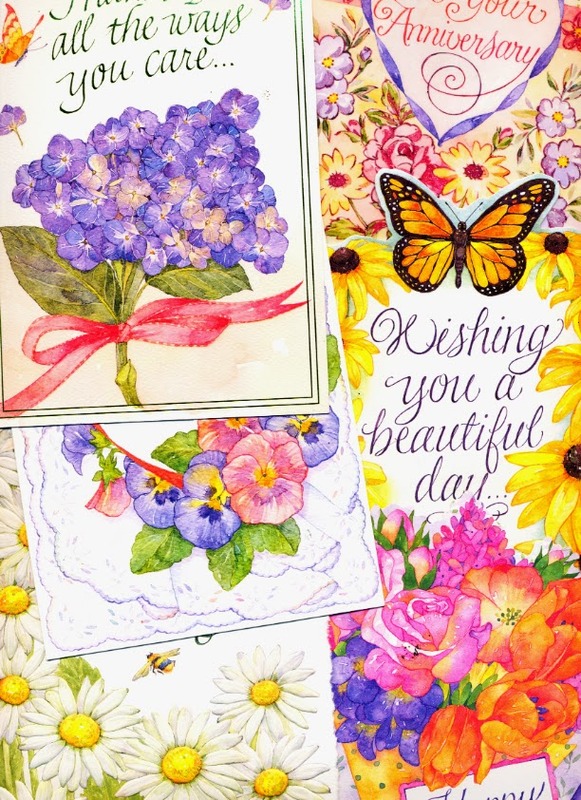 I'll add a scan of just a few of the many many cards I painted featuring flowers. You see the difference! 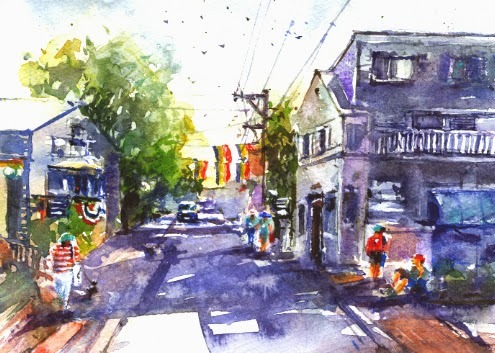 The location for the January 2014 Virtual Paintout was Cape Cod! Wow, I'd love to visit there, but second best may be the Virtual Paintout. It was created by Bill Guffey who chooses a location any where in the world that the Google Street View vehicles and cameras have traveled. Artists find a view to paint and submit their paintings to Bill which he posts on the Virtual Paintout blog and on Facebook. I wasn't able to spend too much time looking around Cape Cod unfortunately. I spent most of my time in Provinetown which has some charming streets and buildings, and I liked the colorful street banners. I was looking for some beach areas for one of my paintings but didn't find anything exciting. I noticed that the street view cameras haven't covered the area very thoroughly. One thing that stood out to me was the lack of graffiti. Must say, the most graffiti I've seen was in Venice, Italy. In January it seemed I had some extra paintings to do so I painted two small watercolors for the January Virtual Paintout. At least I can practice painting figures and cars! A Google Street View bicycle!